This entry was posted in Car Safety Tips on 10/19/2017 by Alejandra Vazquez. With all the technological advancements that allow modern cars to achieve amazing fuel efficiency and adjust performance to prevent engine wear, there’s a lot that can go wrong and leave you stalling out in the middle of traffic. Sometimes all the preventative maintenance in the world can’t prevent a sensor or module from simply shutting off at a crucial moment. After guiding your vehicle as far out of traffic and off the road as possible, your next few actions can save your life by preventing a high-speed rear collision. 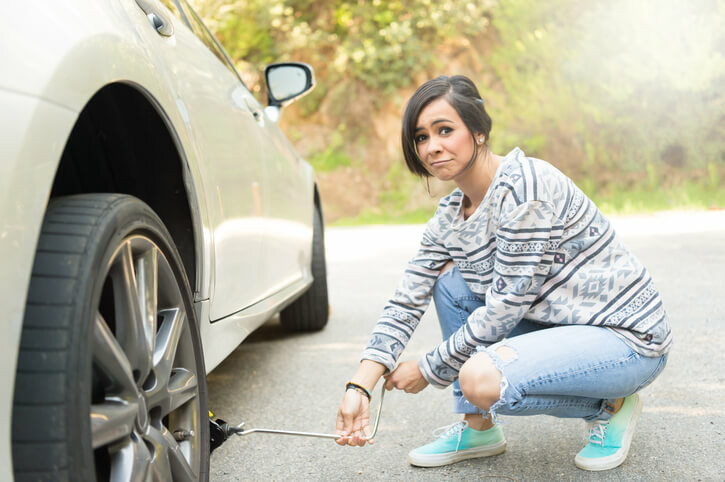 Follow these tips and call your roadside assistance provider or car insurance company for help. Start by switching on your car’s emergency lights. This is usually controlled by a small button located near your headlight controls or below your steering wheel. These lights make your vehicle more visible and help alert any police officers or other public safety officers in the area that you need help. It’s rare that your emergency lights won’t work, but it’s possible they’ll fail to start if you stalled out due to a completely dead battery or a serious electrical fault. If you can’t get your emergency lights to work, try switching on your headlights and engaging your brakes to light up the rear lights. If nothing is lighting up, let roadside assistance know so they can warn the tow truck driver or other responder to watch out for your vehicle. Whether you can get your signal lights working or not, you should set up ground reflectors to catch the headlights of oncoming cars. These reflectors work during both the day and night, offering more visibility than your hazard lights alone when it’s bright outside. Most reflective hazard signal sets consist of small orange and yellow triangles that prop themselves up. Carrying these kinds of reflectors should be as common as carrying liability insurance, but many drivers never think of them until they’re already stalled out. Don’t go into the road to retrieve parts of a damaged vehicle, to set up reflectors, or to flag down help. Stay as far away from the roadside as possible while setting up any external warning signs so that drivers who swerve to avoid your vehicle don’t accidentally hit you instead. Don’t try to work under the hood or assess damage to your car from a collision unless you’re far away from the roadside and the threat of traffic. It’s tempting to try to push your vehicle out of traffic when you’re stuck in a lane or partially out of one. However, it’s too risky and could result in death. Comprehensive insurance can replace your car but it can’t replace you, so wait it out no matter how many people honk or yell at you to get out of the way. Once you’ve set up any reflectors outside of the vehicle, get in the driver’s seat and fasten your seat belt. Get out the paperwork for your insurance policy and roadside assistance and wait for help. You need to stay fastened into your seat in case of a rear or side collision. Using the safety belt gives you the best chance of minimizing injury. Call (800) 777-5620 and let Freeway Insurance protect both you and your car with a great roadside assistance package or request an auto insurance quote online where you’ll be given the option to add roadside assistance coverage to your policy.